A massive human wave is headed for the U.S. border and the president is sending a significant military presence to meet it, but what do the migrants want? The people headed through Mexico towards the U.S. are seeking work and taxpayer-funded benefits, not asylum. “No work, no medicare,” migrant mob member Gustavo Dominguez told Fox News’ William Longeness was his reason for heading back to the United States. Dominguez had been previously deported by ICE so when he re-enters the country illegally, he’ll have committed a felony. To get the Medicare he wants, he’ll have to steal an American’s identity – also a felony. Mexico offered the mob jobs, healthcare, and asylum, which they refused which will make them ineligible for asylum in the United States. It also indicates that they aren’t running away from danger. They are not refugees. The president ordered up to an additional 1,000 troops to the U.S. border, this time active duty military. 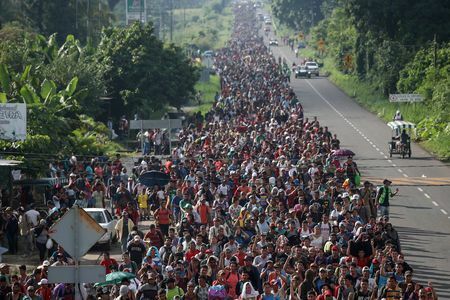 The surge will augment the 2,100 National Guard troops already assisting the U.S. Border Patrol along the southern border. President Trump is also considering the use of a travel ban to prevent the migrant mob from entering the United States. MIGRANT MOB MEMBERS REJECT JOBS, HEALTHCARE & ASYLUM OFFERED BY MEXICO – THEY WANT FREE STUFF FROM U.S.: Thing is, this disqualifies them from asylum in the U.S. so they will have to sneak in illegally & steal an ID. to kill steal & destroy and then they might on, unknown!!! Watch. Just watch. U.S. President Donald Trump’s army will stop this mob at the U.S. Mexico border. The mob will then hop into homemade rafts, boats, anything they can find and head across the Gulf of Mexico and into the Atlantic Ocean. They will then head north up the Atlantic to the “diversity-is-our-strength” capital of the world, Justin Trudeau’s Canada, where they will live high on the hog with free homes, food, clothing and welfare payments for the rest of their lives, courtesy the Canadian taxpayers. Trudeau will ask only one favor from his newest guests as he showers them with gifts. He’ll ask them for their votes in the first election they are able to cast those. And that opportunity will come sooner than ever before after Trudeau rigged up the Elections Act and Citizenship Act with changes. Remember, diversity is our strength!